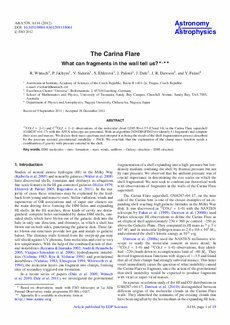 eCite - The Carina Flare: What can fragments in the wall tell us? The Carina Flare: What can fragments in the wall tell us? 13CO(J = 2� and C18O(J = 2� observations of the molecular cloud G285.90+4.53 (Cloud 16) in the Carina Flare supershell (GSH287+04-17) with the APEX telescope are presented. With an algorithm DENDROFIND we identify 51 fragments and compute their sizes and masses. We discuss their mass spectrum and interpret it as being the result of the shell fragmentation process described by the pressure assisted gravitational instability � PAGI. We conclude that the explanation of the clump mass function needs a combination of gravity with pressure external to the shell.